What the blurb says: “When Caleb Wardell, the infamous ‘Chicago Sniper’, escapes from death row two weeks before his execution, the FBI calls on the services of Carter Blake, a man with certain specialised talents whose skills lie in finding those who don’t want to be found. A man to whom Wardell is no stranger. First off, I have to say that this is hands-down my favorite read of the year so far. It has everything I love about action thrillers – the intrigue, the danger, the chase and the multi-layered characters. 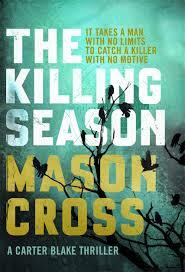 And, it’s Mason Cross’ debut novel, which makes it all the more impressive. The main character, Carter Blake, is something of an enigma – charismatic, highly skilled, and at the top of his game. But he doesn’t let power and politics get in the way of his investigation, and he makes sure justice is brought, whatever the personal cost. So pairing up with Elaine Banner makes for an interesting working relationship – she’s career-driven and has her eyes on the next promotion, working with a talented maverick like Blake gives her a set of problems she can well do without. The antagonist – sniper Caleb Wardell – is a smart and cunning adversary, engaging Blake and Banner in a deadly game of cat and mouse. The tension is high from the get-go and just keeps on rising. So as Banner and Blake pursue Wardell, following the evidence, trying to find a pattern and anticipate his next move, the body count continues to rise. Blake’s the only person who is able to get close, and Banner starts to realise that sometimes the only way to get the job done right is to step away from procedure and follow your instinct. As Blake and Banner get closer to the truth, they become targets – in the sights of Wardell and someone in the Agency itself – question is, can they get to them both in time, and get out alive? I cannot sing this novel’s praises highly enough – it’s a joy to read, utterly engaging and kept me hooked right from the first page to the last. There’s high stakes and high tension, and the chemistry between Blake and Banner sizzles off the page. If you love action thrillers, if you love crime fiction, go and read this book. I’m sure you won’t regret it. Ooh this sounds so far up my street it could have been called The Killing Season, Claire! AND I’m researching a death row escape right now, so I can even justify it as research – score!! Excellent! I totally recommend it – enjoy!